SCH have launched both an inline and batch conformal coating AOI system which can use either static cameras or scanning technology depending on the budget of the customer. Conformal Coating Inspection is a critical and often neglected stage of the conformal coating process. The standards such as IPC A 610 are explicit in their requirements for conformal coating inspection yet few companies actually inspect to that level. Visit our stand 3125 to discuss your Conformal coating AOI needs. 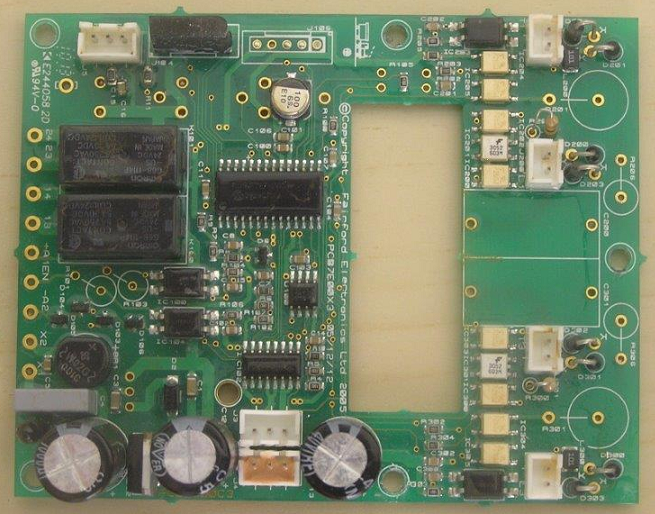 Using conformal coating masking boots in protecting printed circuit boards (PCBs) from application errors is a low cost, highly reliable solution and applies both for parylene and liquid conformal coating processes. Trial our custom masking boots for free when you visit us at the show. We will make the boots for you to use in your process and we will help you calculate the Return on Investment. Save up to 90% of your costs in your conformal coating process and try our boots. As part of SCHs expansion into India we are also offering a one time special deal. We are offering hugely discounted Nexus consultancy packages worth $1000 for 12 months at a special rate of $100 each. This offer is for companies who sign up at the show and wish to take advantage of exclusive technical support for 12 months. This unique offer is only available for the limited period of the show and offers Indian companies the chance to have their conformal coating processes examined. Talk to us now about securing your conformal coating support package. 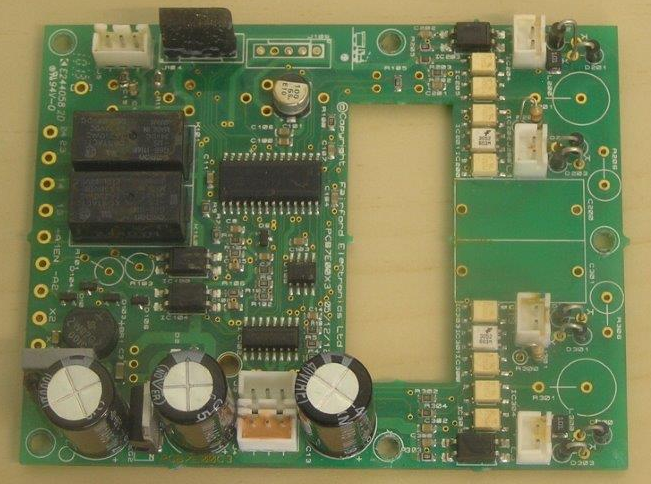 What is the maximum height of components on the PCBs for a standard Conformal Coating AOI system? This can be critical so important to know due to the length of the machine required and the imaging technology used in the conformal coating AOI. Camera slightly to the side. Hidden areas behind the components are now shown clearly. The first question to ask is are the PCBs 3D in nature or are very flat? This helps determine whether we use camera or parallax free scanning technology? Parallax is defined as a displacement or difference in the apparent position of an object viewed along two different lines of sight, and is measured by the angle or semi-angle of inclination between those two lines. How this relates to conformal coating AOI is that with a fixed camera or a standard scanner the camera is at a fixed point and the circuit board with its 3D components may have “shadows” where the camera cannot see down the side of the components. This can be seen in the two photos below. 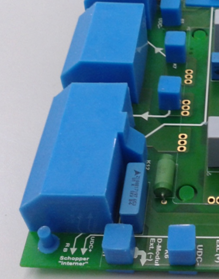 Take a look at our Conformal coating AOI Parallax link here to understand the issues more. Click For further information on Conformal Coating AOI Systems from SCH Technologies. What standards can the SCH Technologies Conformal Coating AOI systems inspect to? It is very difficult to inspect to IPC Class III standards as it is under magnification, is time-consuming and challenging for operators. Also, it is very difficult generally for customers to produce conformal coating finish to this level without creating lots of defects. The key to all inspection, manual or automatic, is to decide what you are looking for. 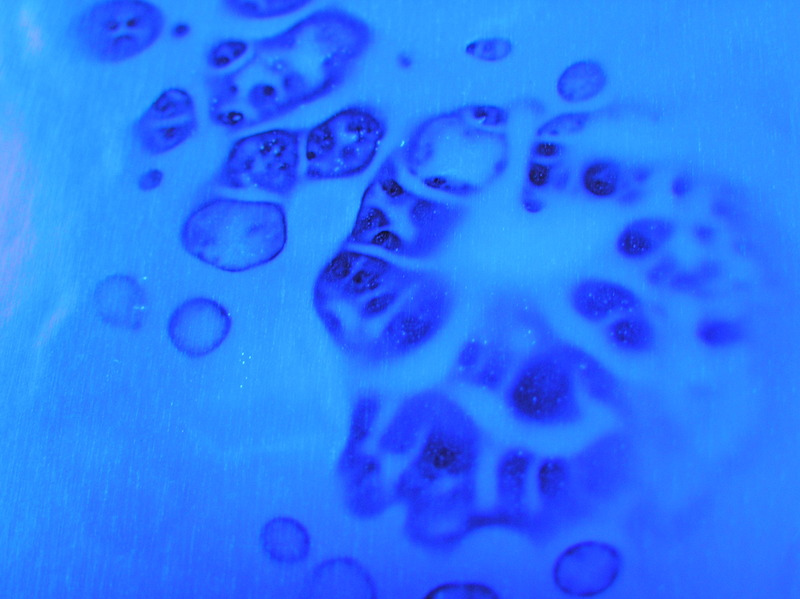 So, what type of conformal coating defects are you looking for? Are you looking for bubbles?Are you looking for foreign bodies? Or is it just coating in the right place and coating not in connectors? These questions are related to the inspection criteria you desire and it is very important to define exactly what are you actually looking for. The software we use can measure all of these factors. The key is to understand whether your production process can stand up to the level of inspection/interrogation that the machine will provide? So, finally automated conformal coating inspection of circuit boards is coming of age. Or has it? Conformal coating Inspection is the last process in the application process that is still at least 95% a manual operation. A typical scenario is a $100,000 line of selective robot and curing oven with a sophisticated set of process controls applying and curing the coating and an operator at the end of the line manually inspecting in a conformal coating inspection booth under a black light. This happens all over the world regardless of the sophistication of the company. Yet, there is a wind of change and now conformal coating Automated Optical Inspection (CCAOI) machines are appearing on the market. So, is it finally the time for conformal coating automated optical inspection? My honest opinion is yes it is but it depends on what you want to inspect! The fact the coating is translucent so you can see everything behind it. This can really fool an automated optical system so care needs to taken. The quality of the fluorescence of the conformal coating itself. A few coatings like silicones can have terrible luminescence under UV light and give very little contrast with the background. 3D effects of the components and the design meaning the cameras or scanners can’t see all of the board. An operator twists and turns the PCB to do this. The difficulty of interpreting the inspection standards like IPC. This can be a real headache to understand and agree what is good and bad. The systems actually can see more than the average operator can and reveal that the conformal coating application process is not under control. Suddenly, production stops because faults not seen previously are everywhere! All of these problems can add up to a real headache for production and really convince you not to adopt CCAOI. So, where could conformal coating automated optical inspection actually be used reliably? Inspecting selective robotic application of conformal coating. This is where you are determining whether conformal coating is in the right place on the circuit board and not in the wrong place after the robot has applied the coating. Note this is not the same as inspecting a board that has been completely coated with a dip system or a spray gun. A robot in general only applies coating in a 2D pattern and can misfire. The CCAOI system can help monitor this highly effectively. Providing a record for traceability. Accountability that a circuit board has been correctly conformal coated may become very important in the world of warranties and liability. Capturing data on the coated PCB could play a part in proving that a circuit board did not fail due to the coating. Inspecting to IPC standards on 2D circuit boards. It is perfectly possible to inspect to the IPC standards. Software exists which has been designed around the inspection criteria. But, its all about the visibility of the coating on the circuit board and the quality of the application process. After all, if the process is out of control the line will just stop. So, will we see more automated conformal coating inspection in the future? CCAOI is here now and being trialled by several of the large companies. Solutions are available at both the budget and high end of the scale and being refined all the time. But, care has to be taken to truly understand what the system is there to achieve and the limitations of the technology available. Click for further information on conformal coating automated optical inspection or contact SCH to discuss your needs. How do I avoid Parallax in my conformal coating inspection process? To achieve parallax free processing you have to use a specialist lens which removes the parallax issues from the scanning process and eliminates shadows down the sides of high components. 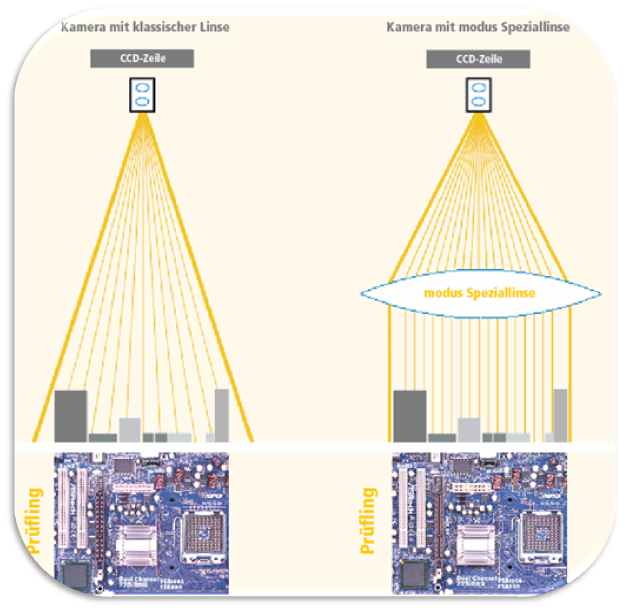 Fixed camera solutions or scanners with a fixed camera system at the centre can suffer from parallax where high sided components can cause shadows in image processing. Modus have made unique technological advances in parallax-free image capturing for conformal coating processing. They use a specialist lens on their scanner based system that adjusts the lens focus so the image appears to be viewed from above at all points along the scan. Click Automated Conformal Coating Inspection System for further information on the Modus system. What is parallax and why is this important in my inspection of conformal coated circuit boards? In figure 1 some components are obscured by others since the camera is not vertically above the board. In figure 2 the image shows the components directly from above and no components are hidden by others. Click Automated Conformal Coating Inspection System for further information on how to avoid parallax. It is possible to engineer many of these problems out with options purchased at the time for the selective robot. But, ultimately, no manufacturer of material or equipment will guarantee no problems with their process. So, a conformal coating inspector is needed to check the quality of the process. Yet, why is this the last part of the coating line that is generally not automated. The rest of the line is and the majority of an assembly line is. But, in conformal coating the general industry still relies on an operator visually inspecting a circuit board by eye under UV light. However, it is well known that operator fatigue leads to errors in inspection. Therefore, PCBs that are coated incorrectly will get past the inspectors. Hence, an Automated Conformal Coating Inspection System can be used to remove the operator error in the line and improve the process.